Home remodeling is a popular choice for many homeowners. It adds property value, boosts indoor comfort and enhances curb appeal. While you can remodel just about anything in or on your home, choosing which one to do first can be difficult. Rogers Roofing can help you prioritize your home improvement plans with the following tips. 1. Set a realistic budget. When setting a budget, consider the size and scope of the project. For example, Munster roofing replacement won’t involve the same costs as a window installation. It’s also a great idea to set aside a contingency fund in case there are unexpected expenses during the project. 2. Decide what needs to be done first. Even if you have many projects on your mind, think about which ones are the most important. 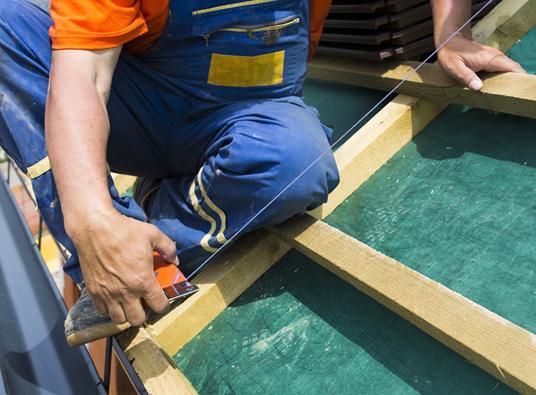 If your roof is in need of repairs, it is crucial that you hire professional help from Rogers Roofing. A roof is your main protection from elements, so it’s more important than projects that focus on visual appeal. 3. It’s OK to think about it. Delaying a project for a few days may let you see better possibilities. This will also help you make a conscious decision on which remodeling project to do first. 4. Make a master plan. Now that you’ve decided which project to do, you should lay out how you want to execute it. Include your budget and design ideas in the plan, and make sure you work with an expert remodeler. With our help, you can experience a hassle-free and enjoyable home improvement project. Rogers Roofing specializes in windows, gutters, siding and roofing in Tinley Park, IL, and the surrounding areas. We provide high-quality products and superior installation services fit to your budget and needs. • Roofing installation using CertainTeed and Vande Hey Raleigh products. • Roof storm damage services, including inspection and repair. • Window replacement using Marvin and Great Lakes products. • Siding services using CertainTeed and James Hardie® products.